Over 100 Varieties of Aroma Semenanjung Feast! 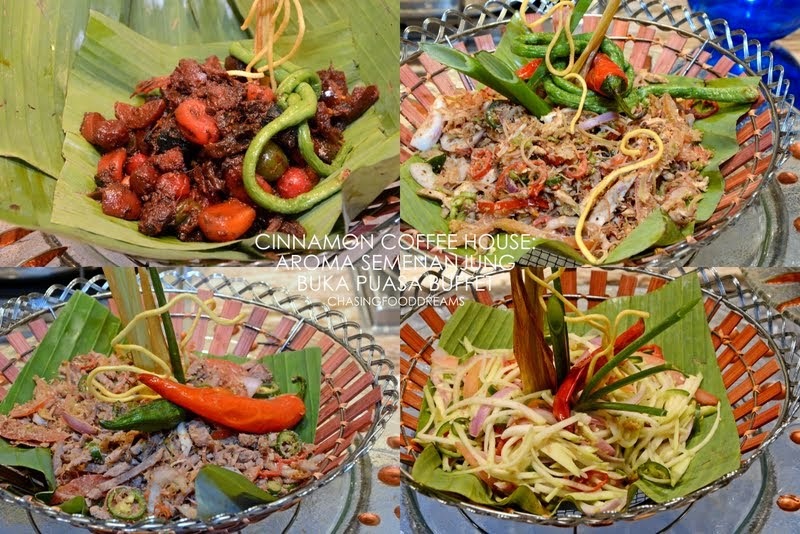 It’s been a week into the holy month of Ramadhan and if you are still looking for a place to Buka Puasa, do head over to the award-winning Cinnamon Coffee House at One World Hotel for a taste of Malaysia Truly Asia featuring multi-ethnic delicacies of Malay, Indian, Chinese, Nyonya and Eurasian. 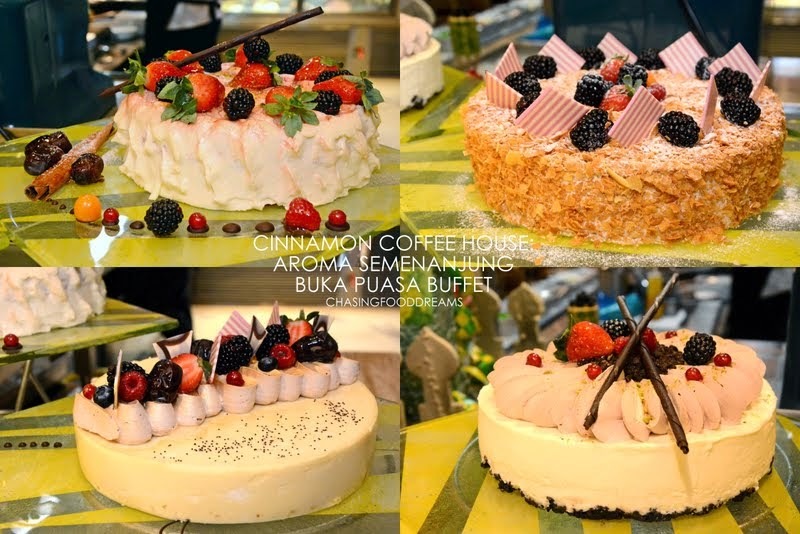 Themed ‘Aroma Semenanjung’, diners are treated to a menu of over 100 varieties each day. 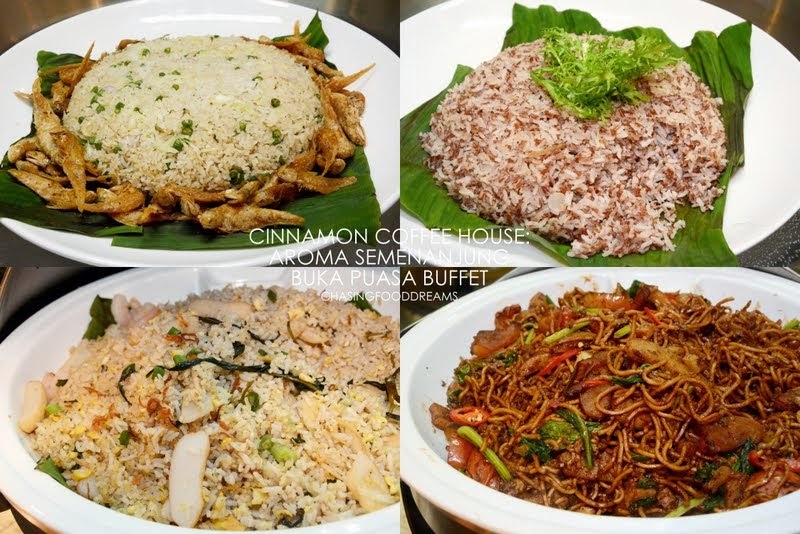 My sixth installment of places to Buka Puasa, Cinnamon Coffee House is no stranger to me. 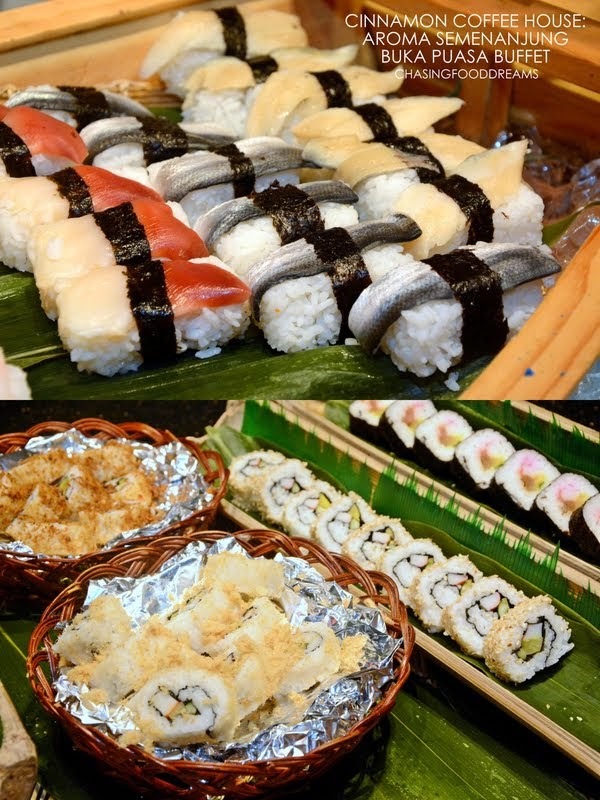 Synonymous for their huge buffet spread, there is always something for everyone. The moment one walks in, the dessert station will have your full attention with its sweet treats. There are plenty of other mouthwatering stations so make sure to check everything out. One of the highlights of the buffet has to be the Roast New Zealand Lamb stuffed with Briyani Rice. Roasted with spices, the lamb is beautifully roasted and tender with lots of flavor. I savored a few slices with Mint Sauce and Black Pepper Sauce with much delight. Sup Tulang Rawan is a perfect way to get the appetite started after a long day of fasting. The soup is spiked with lots of aromatic spices and herbs. One might want to enjoy all the big bones filled with bone marrow goodness! Other soups on rotation are Kambing Rerempah, Soto Ayam and Sup Ekor Pedas. There were few kawah holding curries and one of them is a dry Rendang Tok Gunung Rapat. This one calls for pieces of Lemang for extra richness. Another one holds Kari Ikan Kepala bubbling gently. There are also quite a few Kerabus at the appetizer bar. 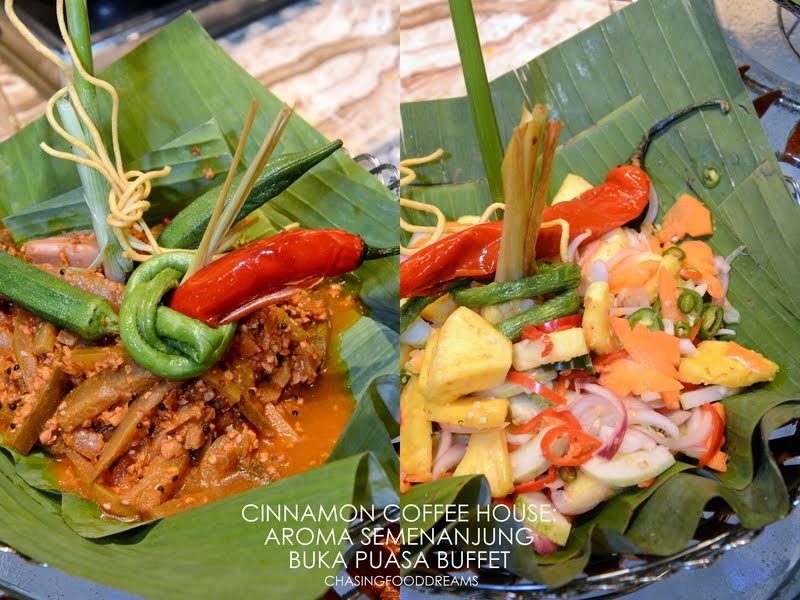 From Acar Buah, Kerabu Mangga and Betik Muda to Acar Timun dan Nenas, Kerabu Daging and more, there are also an array of Ulams and Sambals. 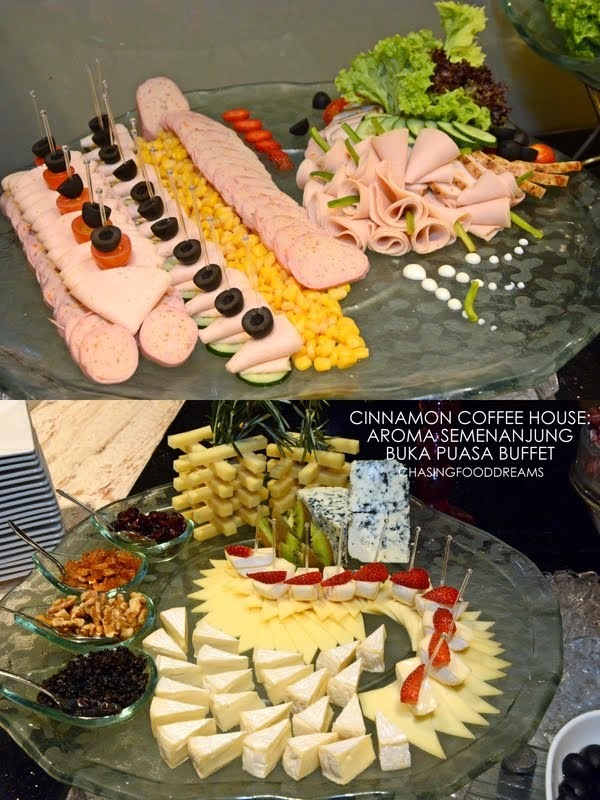 Check out the DIY Caesar Salad, Cold Cuts and Cheese Smorgasboard. Seafood on Ice had crushed ice holding weights of Chilled Prawns, Mussels, Crabs and Fresh Oysters. Platters of Nasi Dagang, Nasi Ulam, Nasi Pelangi and Nasi Kerabu are the perfect companion for Sambal Sotong, Gulai Ikan and Paru Goreng Cili. Make sure to enjoy these with Telur Masin and Ikan Masin with Sambals for extra oomphs! 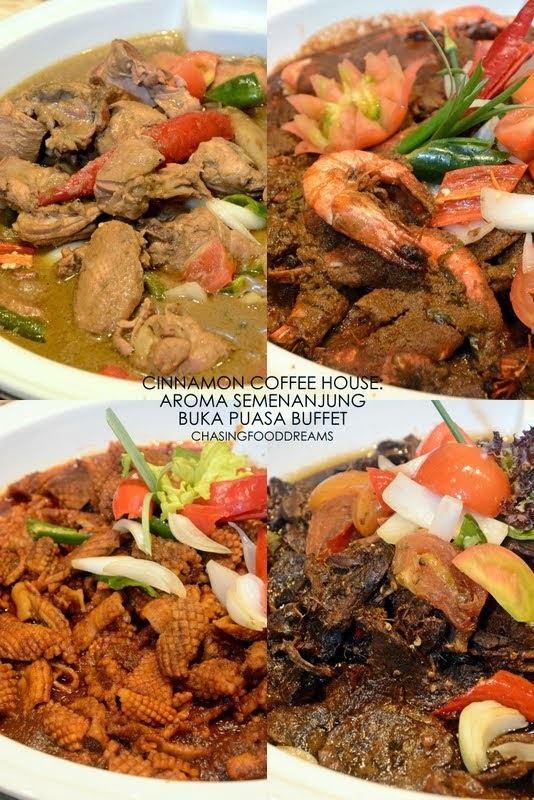 Hot buffet warmers showcase Beef Sumor Kalimantan, Rendang Tiger Prawns with Kerisik, Chicken Kurma Rajawali, Petai dengan Sotong, Ikan Patin Masak Tempoyak, Daging Sumor, Sotong Kalio Batawi, Sayur Leman Nangka and more. Don’t miss Ayam Percik, Puyuh Goereng Berempah, Ikan Bakar, Satay, Murtabak, Sotong and Kangkung, Bubur Lambuk and other scrumptious local delights! There is also a Bread Station featuring beautiful fresh baked goods. 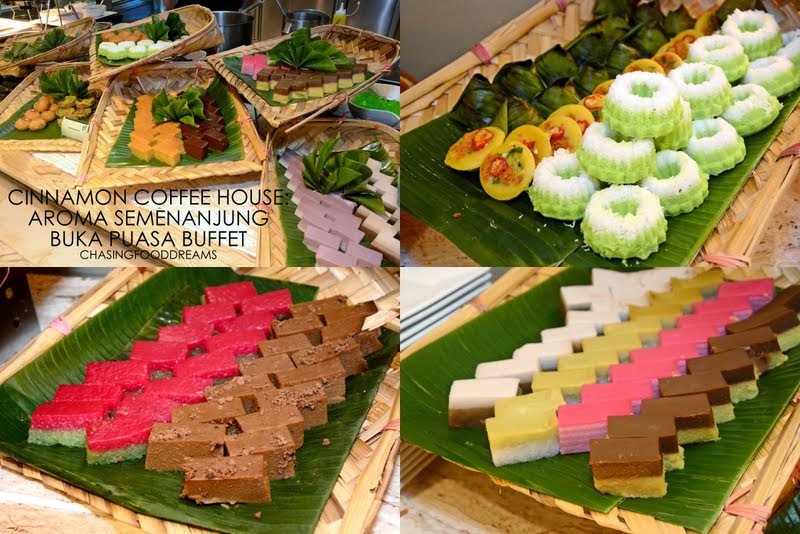 As mentioned earlier, the Dessert Station is filled to the max with lots of Malay Kuihs, Aneka Raya Cookies, Kurma, Serawa Durian Pulut, Tapai Pulut, Pandan Kurma Mousse, Ice Kacang and Cendol. These make the perfect ending to a Buka Puasa feast. 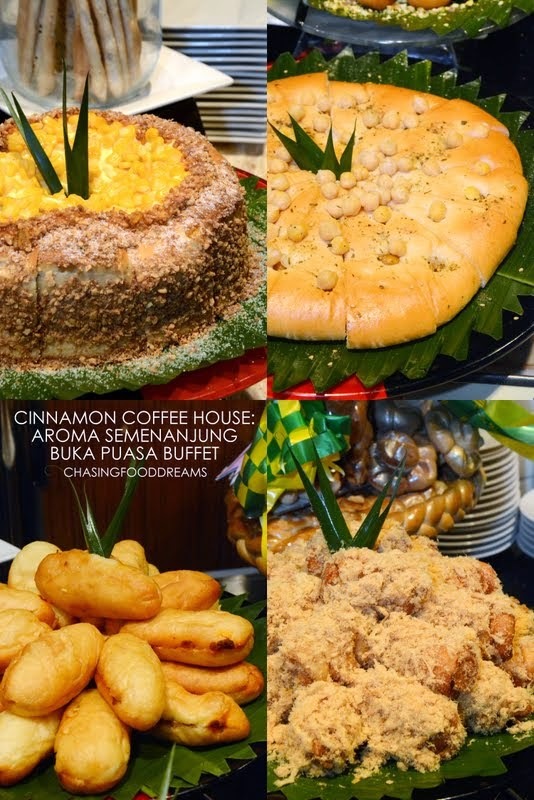 Of course there are more desserts, this time international one featuring Western desserts of Cakes, Puddings and Tarts, Fruits, Ice Cream and Fried Ice Creams, Chocolate Fountain and more. 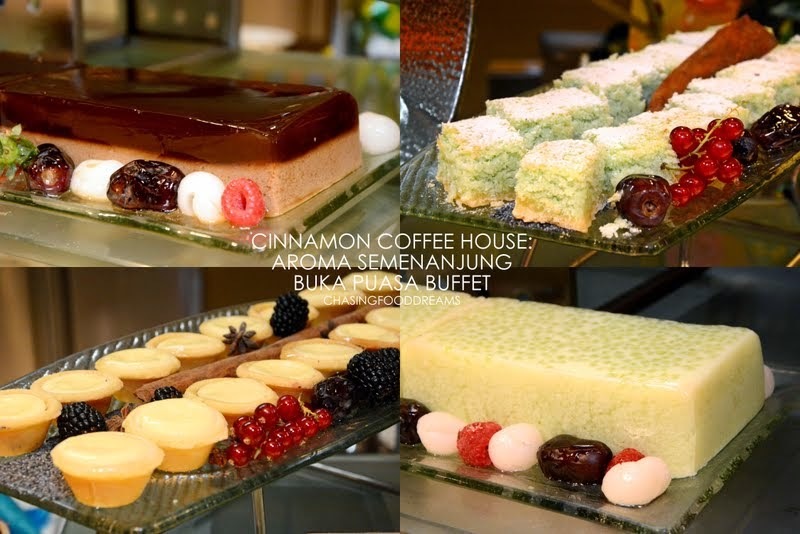 The buffet has so many choices to satisfy everyone’s tastebud. 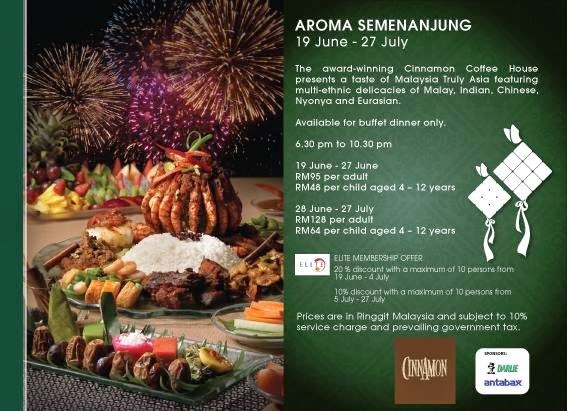 Daily buffet dinner starts from 6.30pm to 10.30pm and priced at RM95++ for adult and RM48++ for children aged 4 – 12 years for 19 June – 27 June 2014. 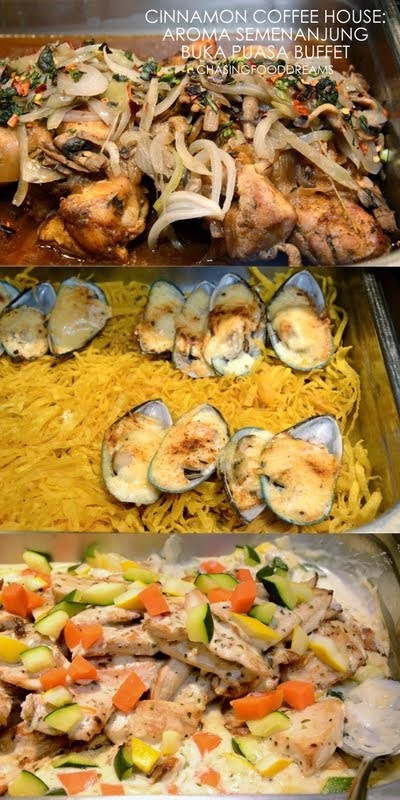 From 28 June until 27 July 2014, the buffet dinner will be priced at RM128++ and RM64++ respectively. *Read about my last year’s Ramadhan here. Gosh!! I can smell the aroma! LOL!!! I do wish they would not have those "western cakes", the chocolate fountain and all though - not quite in line with their Malaysian theme. Sticks out like a sore thumb.